Each fall Professional Baseball Instruction invites college coaches, recruiters and professional scouts from around the area to come watch the area’s top high school, junior college, college athletes looking to transfer and free-agent pitching and catching prospects work out for our Battery Invitational Showcase. This is a great opportunity for you to showcase your skills up close and personal to DI, DII, DIII, NAIA, JUCO colleges and professional scouts. For complete details including price and a registration form click here. Check out highlights from our 2017 event (for video highlights from previous years, scroll to the bottom of the page). 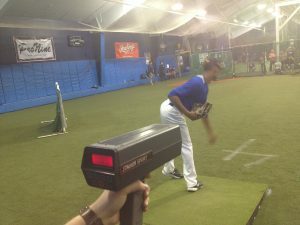 CLICK HERE for radar gun readings and pop times from our 2017 event. Click here to see pictures from our 2017 event. Click here to see pictures from our 2016 event. Click here to see pictures from our 2015 event. Click here to see pictures from our 2014 event. Here’s a preview video including footage from our 2015 pre-showcase workout. Here’s a video look at an individual pitcher’s day at our 2015 showcase. It takes you from sign-in, to stretching, to loosening up, playing long toss on flat ground, throwing a warm-up bullpen, to throwing off the mound in front of college recruiters and professional scouts.